To all our distributors: don't hesitate to ask for our high-quality promotional material that will make Happy Cube a success in your country. Some recommended Happy Cube retail practices for our distributors and shop-owners. Demonstration of the Happy Cubes at the Frankfurt Buchmesse 2010. Organise a demonstration or contest and let people experience the good qualities of the Happy Cubes. Let teachers and pupils in schools discover the effects of using the 3D puzzles in their class. Who is the fastest? Who can make a sensational big construction using many puzzle stones. Who can guess the right number of used stones? Make a bridge or a tower... This and several other statements encourage the puzzle game. 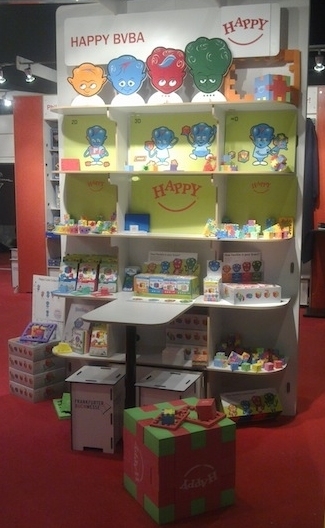 Happy booth at the Nurenberg toyfair 2012. Happy Cube is demonstrated and exhibited at several international and local fairs. Big construction and Toby character (Happy Cube). Order big colourful cubes to use them as an eye-catcher in your shop. Moreover you can use a demonstration video on a large screen so you can catch people's interest and give them more information about Happy Cube. Promote Happy® products on internet through websites and social networks as Facebook and Twitter. Spread the Happy word! 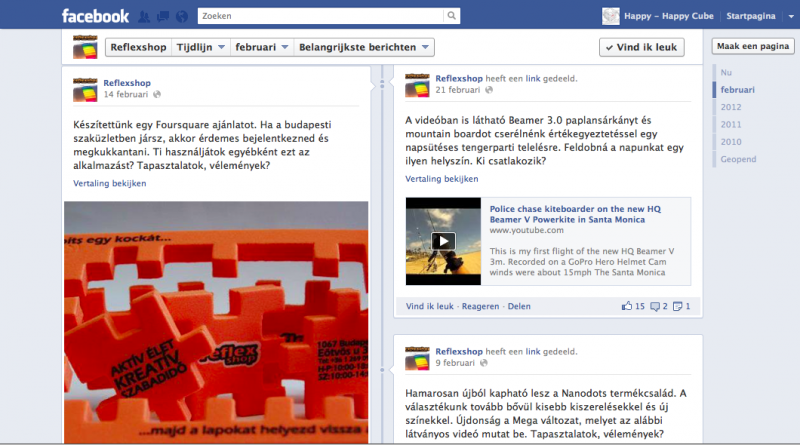 Check and like Happy's Facebook page. Promotion is a great way to attract new customers. 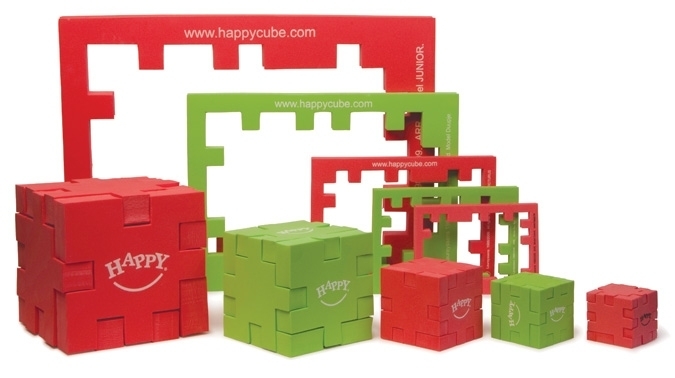 Happy® has a wide range of promotional items such as leaflets, posters, movies and large Happy Cubes. Click on the pages below and get some inspiring ideas. We offer you big promotional cubes in several sizes and colours. When you place an order we can deliver these big cubes on demand. You can download high resolution pictures in the download area (only with login). Download several contemporary Happy Cube puzzle in store video animations in the download area (only with login). In Denmark in 1992 in one year we sold the cubes to 33% of the population (1 650 000 puzzles) with the aid of an instore video animation. 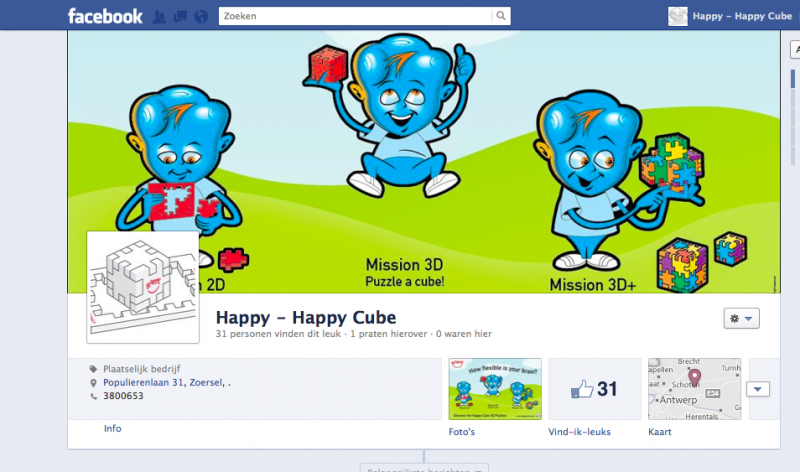 In the Netherlands in 1990-1991 the Happy Cubes© came on the market as the Wirrel Warrel Cubes®. In less than 18 months, 5 000 000 puzzles were sold by the aid of posters, ads in magazines and newspaper articles. Would you like to create the same success in your country? Together we will set up an original launch! Happy Cube keeps you happy. 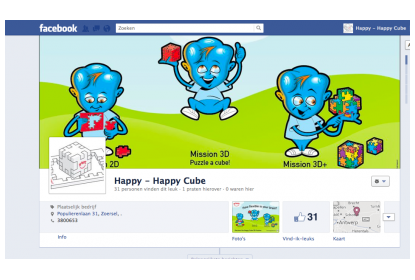 Happy Cube is puzzling with head, heart and hands. It is the perfect puzzle for young and old, suitable for many target groups in different situations. 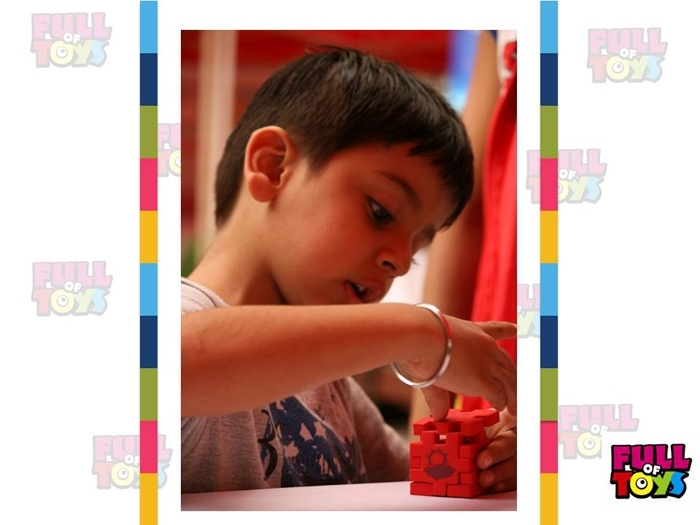 Smart Cube and Little Genius are the best toys for the youngest and toddlers. These are safe toys and by playing children develop skills such as spatial awareness. 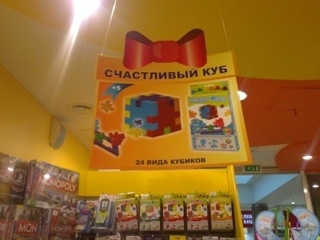 The entire Happy 3D Puzzle Collection and the Flower Surprise fit perfectly in toy-, game, stationary- and bookshops. The Happy Puzzle Collection can be integrated at school to develop mathematics skills as well as for students who have learning difficulties. Differentiation between students is goes easily. 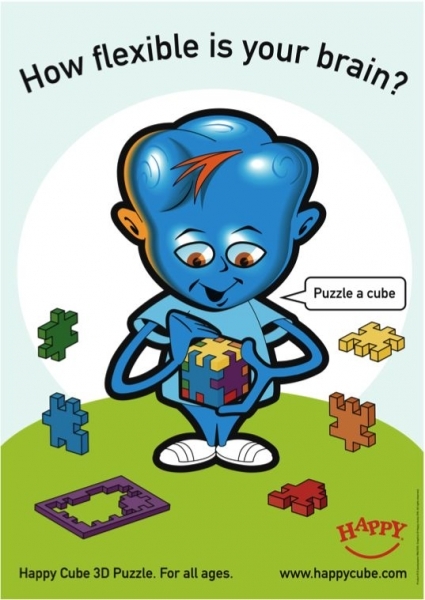 The Edu Cube Collection (Smart Cube and Happy Cube XL) is a special 3D puzzle cube selection for in the classroom or at home, with a guiding booklet or cards with challenges in different levels. 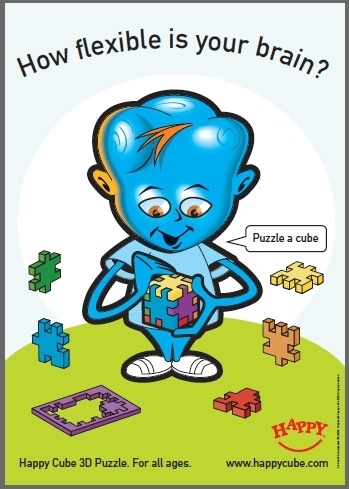 Specialy for kindergartens and primary schools we have the Smart Cube Edu Pack, with 42 puzzles and teacher guidance cards. We recommend the mini-combidisplay, a small display with a mix of puzzles next to the pay desk. The Happy Cube Family in 6-packs and combi-display is a smashing point of sales. Puzzlefans get addicted with the entire Happy Puzzle Collection. Promote the cubes excellent in their country. So that they become a best-seller after a while. Recognise that it takes a while to introduce the product into the market. 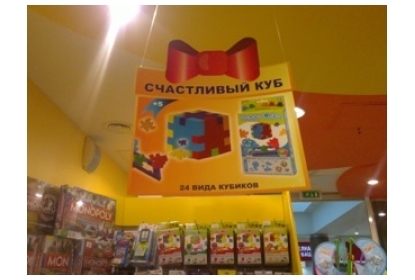 Buy and sell a huge quantity of puzzles each year. 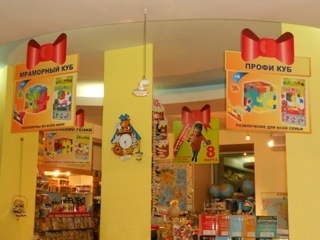 Appeal different segments of the market (toyshops, schools, bookstores…). 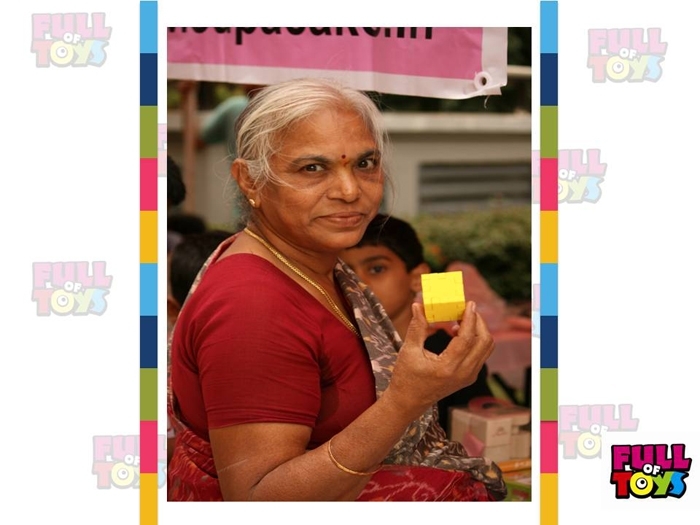 Have their focus on selling the Happy Cubes, besides other quality products. We have attention for our precious planet Earth by focusing on sustainable and environment-conscious material and packaging. The specific EVA material we use is part of the Happy Cube puzzle concept. The bright colours support the differentiation and the flexible soft material carries the constructions as a solid puzzle. We guarantee that our foam is 100% European made and child safe, so that Happy Cube puzzling can be really fun, for children and adults. Our games have been tested and approved by TÜV-Rheinland and TÜV-Hong Kong. 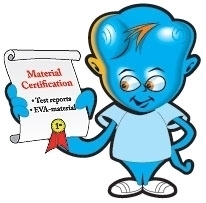 The reports include EN71 and ASTM: Phthalates, lead content and flammability… Other labs like the United States Testing Company and Mc Donalds (lab test in Hong Kong) also approved our Happy Cube puzzle samples. 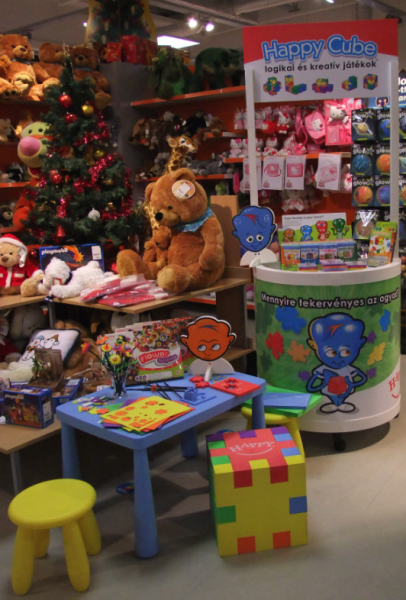 Happy® works conform the EU-guidelines for toys. The sign CE is displayed on the packaging. The Happy Cube© is made of soft and solid foam of a very good quality, with no smell: EVA-foam (ethylene vinyl acetate). EVA feels like velvet and resembles the feeling of human skin, therefore it gives a safe feeling to children. You can wash it at maximum 30°C, so you can play with the Happy Cube puzzles endlessly. Moreover, our foam is partly made from natural rubber. 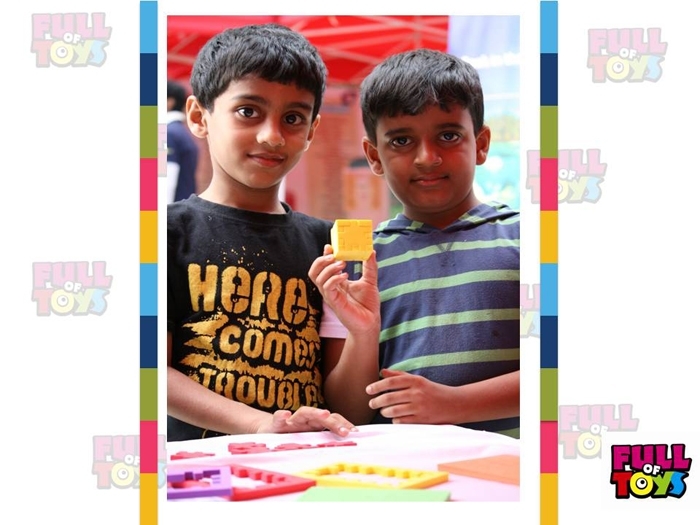 The puzzle is produced without CFC’s (chlorofluorocarbon) and is friendly to the environment. However manufacturers (mostly from Asia) profit from cheap but harmful substances, such as formamide, by mingling it through their foam. In itself, this proces is totally pointless for the production of EVA and redundant." We feel the health of children is most precious on earth. We take care for our manufacturers responsability as market builder and guarantee that our foam 100% European made and child safe.